Coriant introduced its Intelligent Optical Control (IOC) for optimizing the optical layer using Software Defined Networking (SDN) technology. Coriant is presenting the solution for the first time at this week's WDM & Next Generation Optical Networks conference in Monaco. Coriant said its IOC is a fully integrated solution for the operation and planning of multilayer networks: TNMS, TransNet, and TransConnect. The company claims operators can now implement new services up to 90 percent faster. Its testing showed that the set-up time for a 100G data center service dropped from hours to minutes using the automation provided by IOC. "We are proud to present IOC today as the industry-first solution that successfully overcomes the complexities of managing the optical layer and offers its advantages and potential for our customers," said Uwe Fischer, CTO and SVP Product Management, Coriant. "Our long-term investment in R&D as well as our experience with complex and sophisticated meshed optical networks has paid off: Accessing the optical layer via IOC adds significant performance and increases the utilization of the existing infrastructure. IOC is interoperable with third party network elements and controllers due to its modular architecture and standardized external interfaces, thereby being able to control multi-domain networks while protecting operator’s investment." In May 2013, Coriant, the former optical networking division of Nokia Siemens Networks, began operations as an independent company following completion of the deal by Marlin Equity Partners. 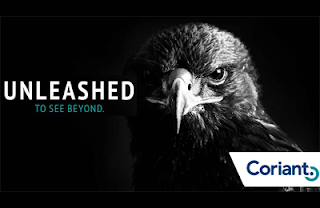 Coriant mission is to be a global supplier of leading optical transport solutions and software-defined, optical layer intelligence to Tier 1 networks. The company operates worldwide in more than 48 countries and is headquartered in Munich, Germany. Coriant has R&D centers in Asia, Germany, Portugal and the U.S., as well as a production center in Berlin, Germany. ADVA Optical Networking has added an IEEE 1588v2 mini-Grandmaster (miniGM) clock and Boundary Clock functionality to its FSP 150 family of mobile backhaul products. The new capabilities ensure precise frequency and time synchronization at the network edge and is specifically designed to support the large-scale rollout of small cells for LTE-Advanced and radio access networks operating in unpaired spectrum. ADVA said the deployment of the miniGM as close as possible to the cell site enables the utilization of existing networks for backhaul services connecting LTE-Advanced radio access networks and supporting unpaired spectrum operation. Since GPS is considered being not reliable enough when used as an exclusive clock source, the PTP fallback capability significantly enhances the stability of the synchronization architecture compared to a traditional GPS-only solution. Transmode introduced an "iAccess" solution for delivering business Ethernet and mobile backhaul services. 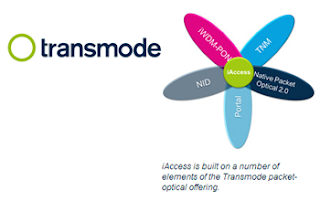 Transmode's iAccess solution combines a new compact low cost Network Interface Device (NID) with the company's iWDM-PON and Enlighten multi-layer management suite to provide a low cost, simple to install/configure/manage and highly scalable solution. The solution uses a "remote port" architecture which makes all NIDs into extensions of the Ethernet Muxponder that they are connected to. With the remote port architecture the NID automatically takes device and service configuration from the network when it is connected. This removes the need for a separate IP address for each NID, saving these valuable and sometimes scarce resources. Transmode said its new solution is ideally suited to Ethernet based services that need to scale to large volumes or where simplicity is key. Sten Nordell, Transmode's Chief Technology Officer, said "The new iAccess solution is a great step forward in terms of simplifying and scaling Ethernet access networks while also enabling network operators to hit the right price points for these high volume services. We have created a real plug-and-play solution where the WDM-PON enabled NID is simply connected to the access fiber, powered up and then services are automatically created. This enables operators to quickly roll out new services with the right level of carrier class functionality such as MEF Carrier Ethernet 2.0 services." 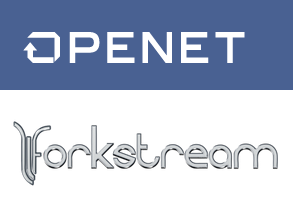 Openet, which specializes in real-time transaction management software and services (B/OSS), has acquired Forkstream, a start-up working on technology to define policies for routing mobile data streams within and between different access networks while ensuring a seamless user experience. Financial terms were not disclosed. Forkstream, which was spun out of University College Dublin and supported by Enterprise Ireland, helps enable consumer devices to discover and communicate with non-3GPP networks such as Wi-Fi or WiMAX. Its ANDSF-compliant client for Android devices interacts with the network core via Openet Interaction Gateway, enabling operators to manage network access policies using their Policy Controls Rules Function (PCRF). The technology is fully compliant with 3GPP Access Network Discovery and Selection Function (ANDSF) standards. Openet's portfolio combines policy and charging control with device and third party interaction to enable innovative charging models, to control operating cost and to personalize services. "Integrating Forkstream into the Openet PCC ecosystem enables our customers to overcome many challenges related to seamlessly integrating multiple access networks with cellular services," said Openet CTO Joe Hogan. "They developed an elegant solution to ensure cross-network session continuity and flow management, which is key to a quality user experience." Forkstream technologies extend the functionality defined within the 3GPP standards to include dynamic network selection as well as analytics and monitoring. "We are thrilled to join the world's leading PCC vendor at a time when Operators are investing heavily in multi-access networks and cross-network services," said Forkstream co-founder John Fitzpatrick. "Supporting network access decisions within the policy and charging infrastructure makes it easy for operators to deliver more to their customers." By interacting with the PCC infrastructure through Openet Interaction Gateway, Forkstream technology enables a mobile device to direct data flows across multiple networks simultaneously depending on defined PCRF policies. This provides granular control of traffic offload policies and enables new business models that include service options specific to an access network. The Broadband Forum released new test plans aimed at accelerating G-PON deployments. "Service providers need world class, market-ready ONUs and network interoperability," said Robin Mersh, CEO of the Broadband Forum. "To reduce the cost of fiber rollouts, providers want standards-verified fiber products. With a reliable certification program, testing burdens decrease, and more vendors can ship interoperable products, which means a reduced time to market." This release also includes two pending technical reports: a new test plan for XG-PON1 (WT-309), as well as a new PON Optical Layer management report (WT-287). WT-287 looks at how to optimize a multi-service PON network catering to both business and residential customers. It covers system architecture, use cases, functional requirements and interoperability requirements. The specifications in WT-287 apply to both ITU-T and IEEE PON systems. The Broadband Forum has approved an independent testing laboratory to conduct BBF.247 ONU certification. The approved lab is LAN Laboratories, based in France and China. Thomas Wheeler appeared before the Senate Commerce Committee for a confirmation hearing to be the Chairman of the FCC. In his prepared remarks, Wheeler expressed his deep commitment to competition, saying that the FCC role must evolve to encourage and protect competition. He also spoke of the need to ensure that American values and technology are in sync, such as extending Universal Service for broadband, protecting consumers, assisting the disabled and ensuring that first responders have the communications equipment they need. 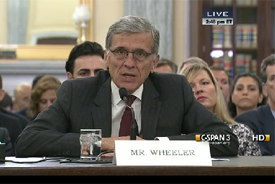 Wheeler said that if confirmed he will move expeditiously on spectrum auctions. He also vowed support for the E-Rate program for broadband in schools and libraries. An archive of the hearing is available on C-SPAN. AT&T has begun offering expanded Virtual Private Network (VPN) bundles that provide free Mobile Remote Access that allow users mobile access from virtually any device. The new VPN value bundle enables customers to connect up to 100 mobile devices with mobile remote access and global WiFi, as well as VoIP calling options and security services. Mobile Remote Access Services enables customers to extend their VPN connection to their mobile devices. "The need to mobilize business has never been more important," said S. Dale McHenry, VP, Enterprise Networks at AT&T. "We are pairing our expertise in mobility and virtual private networking to deliver a truly game-changing combination of features and services to our customers. C Spire Wireless has selected Devicescape's Curator Service to help its mobile customers to better manage data usage and ensure superior connectivity. The Devicescape Curator Service allows users to gain automatic access to the company's growing Curated Virtual Network (CVN) of over 12 million high-quality, public Wi-Fi hotspots, which are continuously QoE tested in real-time to ensure they meet C Spire's requirements for a carrier-grade quality experience. Devicescape's Curator Client, working together with the Curator Service Platform in the cloud, identifies the best available connection at any given time and connects to it, resulting in simplified connectivity and increased overall Wi-Fi usage. C Spire customers can download the free WiFi On app from the Google Play store on any Android-powered smartphone with the 2.2 (Froyo) or later mobile operating system. The app also will come preloaded on new C Spire Android-powered smartphones, including two that will be arriving soon on the company’s 4G LTE network - the Samsung Galaxy S 4 and the HTC One. The app prompts users to add their own home Wi-Fi networks, automatically connects to public hotspots when available and saves battery power on smartphones and tablets by turning the device’s Wi-Fi radio signal off when it isn’t available or strong enough to provide a quality experience. C Spire Wireless offers a suite of personalized wireless services and premier mobile communications devices to nearly one million subscribers. The carrier is based in Ridgeland, Mississippi. "Our priority is to deliver a personalized, high quality wireless experience to our customers and offer services that anticipate their needs," said Kevin Hankins, chief operating officer for C Spire Wireless. "As customers use their devices for more services and applications that require data, implementing Devicescape's service will help them better manage data while improving the quality and speed of their total data experience. We've been an industry leader for over two decades by introducing new services that help customers get the most value and benefit from their wireless plan. Selecting Devicescape's service will allow us to continue that trend." 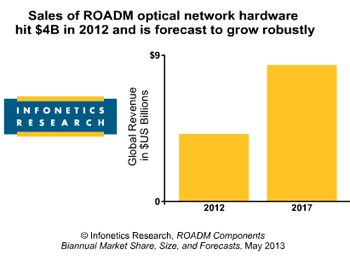 The global WDM ROADM equipment market (not components) reached $4 billion in 2012, up 10% year-over-year, according to a new report from Infonetics that tracks the reconfigurable optical add/drop multiplexer (ROADM) optical network equipment market and the wavelength selective switch (WSS) components within it, measured by spacing technology and degree count. The leading vendors in the WDM ROADM optical hardware market in 2012 include Alcatel-Lucent, Huawei, Ciena, and Fujitsu. "It’s been a tough road for WSS components these past couple of years, with quarterly revenue down nearly 50% from the highs two years ago," notes Andrew Schmitt, principal analyst for optical at Infonetics Research. “But we believe there’s some modest growth ahead tied to the deployment of new 100G coherent systems and the rollout of colorless, directionless and contentionless (CDC) ROADMs. While the level of interest in CDC ROADMs is very high from vendors, the current pricing premium given to this architecture by equipment vendors will slow adoption." SanDisk rolled out a new version of its FlashSoft software for Windows Server and Linux operating systems that allows users to increase application performance while reducing overhead on storage systems, at a lower overall capital expense. support for volume-based storage architectures, including direct-attached storage (DAS) and storage area network (SAN) configurations. FlashSoft software supports SanDisk’s own enterprise solid-state devices, and it’s also compatible with all vendors’ enterprise flash-based systems, including those using PCIe, SAS or SATA technology. Eleven days after the successful launch of the SES-6 satellite on board an ILS Proton booster, the company's next satellite has safely arrived at the Baikonur Cosmodrome in Kazakhstan in anticipation of a July 21 launch. ASTRA 2E, which was built for SES by Astrium of France, uses the Eurostar E3000 platform and carriers 60 Ku-band transponders, as well as 3 wideband Ka-band transponders. It will enable the delivery of next generation broadcast and broadband services in Europe, the Middle East and Africa at the neighborhood of 28.2° East. ASTRA 2E will be the seventh Eurostar satellite in the SES fleet, following the successful launch of SES-6 in June 2013 and ASTRA 2F in September 2012. The integrated top assembly includes the antenna and other optional RF conditioning components such as diplexers and tower mounted amplifiers. These components are integrated into one unit that can be mounted to billboards, street poles and other existing structures, offering adaptability to current conditions. A rooftop version consists of the integrated RF Path unit and non-penetrative supports designed specifically to avoid drilling penetration points into the roof. A monopole version includes the integrated RF Path unit plus a monopole for mounting as a standalone structure on city streets or in traditional cell site locations. This option blends into the existing street appearance while providing needed wireless capacity. 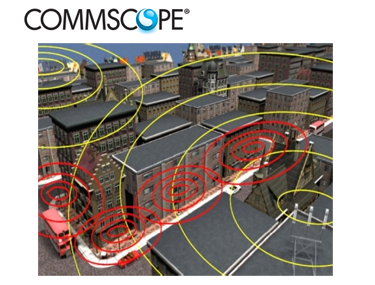 All integrated wireless equipment — including antennas, low noise amplifiers, diplexers, fiber and coaxial cable and cable assemblies — are pre-assembled and tested by CommScope. For critical areas with very high cell density, CommScope offers integration of the Andrew ION-M and ION-U distributed antenna systems. The DAS remote units are integrated into the lower section of the metro cell system and quasi-omni or three sector antenna systems are integrated in the top section. Cloudera named Tom Reilly as chief executive officer (CEO) and Mike Olson as chief strategy officer (CSO) and chairman of the Board of Directors. Reilly joins Cloudera from HP, where he served as the vice president and general manager of enterprise security. Prior to HP, Reilly served as CEO of enterprise security company ArcSight, an early innovator in SIEM technology. In December, Cloudera, a start-up based in Palo Alto, California, closed $65 million in new funding to support its Apache Hadoop-based data management software and services. 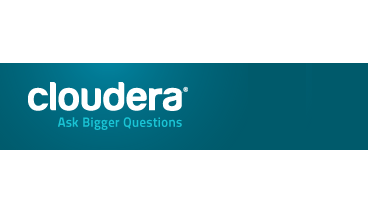 Cloudera offers a packaged solution for enterprise customers to ensure production-ready deployment of CDH4, the most widely deployed and proven commercial distribution of Apache Hadoop.